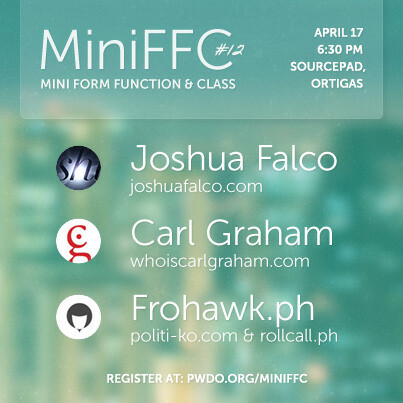 The MiniFFC mini web design conference & meetups started back up again after going into hibernation during PWDO’s conference season (that’s FFC and JFFC). The old schedule was every other month before and after FFC, which (d)evolved into an irregular, arbitrary thing based on how available we were to plan them. The new schedule is now regular and more ambitious: every 3rd Wednesday of the month. Between that and another project right before the next conference, fingers intensely crossed. April 17 at SourcePad was the latest one, and proved to be another killer combo. One thing I really liked was that a couple of the “resources” and speakers were relatively younger than majority of the crowd listening to them. Fresh meat perspective is always a great discovery. A documentary on letterpress in the Philippines by Aceler Chua & Leah del Rio. A study of road-side lettering in the Philippines by Carl Graham. A quiz that calculates which candidates for the 2013 senatorial elections share the same views you do and an interactive graph of roll call attendance at the House of Representatives since July 2010, by Frohawk. I can’t believe it’s almost five years since the first MiniFFC and the inception of this whole thing.